Drawing a whale can seem difficult, especially for a small child. But if he or she starts with a rectangle, it can be incredibly easy! 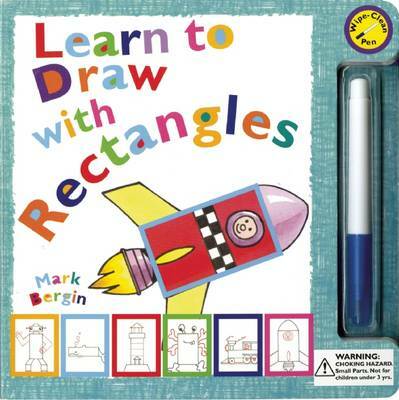 "Learn to Draw with Rectangles" is a book for every aspiring artist. With simple step-by-step instructions, this fun and helpful guide based on three simple ideas--looking, drawing, and learning--teaches kids how to transform everyday shapes into rockets, trains, lighthouses, and other charming pictures. Want to draw an alien? Just start with a rectangle and add some squiggles for wiggly arms and legs. Want to draw a ship? Start with a rectangle, then add triangles, squares, and squiggles for a chimney and some smoke. And if kids want to draw robots, they can start with rectangles and add some circles for eyes and an antenna. With a special pen and pages that wipe clean, kids can practice their favorite shapes until they're perfect. "Learn to Draw with Rectangles" helps kids lay the foundation for a lifetime of creativity!